In 1980 Malvin et al. undertook an investigation of elemental variations of Re, Ir and Au in 10 masses from the Windhoek pile of Gibeon meteorites (collected by P. Range) and found a 10% variation. The authors stated that if these variations were part of general fractional crystallization trends, these would indicate relatively small (order-of magnitude 100 m) radii for the parental magma bodies on the Gibeon mother body. El Goresy et al. (1984) analyzed three Gibeon samples and found structural and chemical evidence that the material underwent several heating episodes after formation and subsequent cooling. According to their findings the Lion River sample was heated to below the Fe-FeS eutectic and possibly to below the breakdown temperature of pentlandite – 610°C. Other samples appeared to be affected by heating to above the FeS-FeNi eutectic which was attributed to shock melting upon impact on the mother body. Several researchers investigated the brittle-ductile systematics of the IVA mother body with interesting results. Matsui et al. (1984) simulated high and low-velocity impacts into Gibeon material. Their experiments revealed the brittle behaviour of the material at low temperatures. Consequently, even if IVA iron meteorites were originally the core of a layered parent body, they might be subsequently destroyed in a brittle manner. Matsui’s results underlined that the brittle behavior of iron-like planetesimals in the low-temperature asteroid zone prevents the growth of these bodies into full-size planets. Based on their study of bidirectional reflectance properties including Gibeon samples Britt et al. in 1988 suggested M-type asteroids (e.g. 16 Psyche) as a possible source of origin for Gibeon and other IVA iron meteorites. In addition to the work of Malvin et al., Scott et al. pointed out that the parental liquid pool of the Gibeon meteorite on the IVA mother body was at least many meters in size. Pools this size quickly sink through the silicate and the authors conclude that the Gibeon IVA material very probably comes from an asteroidal core. Several researchers noted the unusual content of silicates in Gibeon (e.g. Berwerth 1902, Moller et al. 1992, Prinz et al. 1982). Considering the trace amounts of silicia Scott stated that either a small size of the mother body caused inefficient removal of trapped silicate liquid, or, alternatively, that temperatures occurring on the Gibeon mother body were never sufficient to melt the mantle entirely (Scott et al. 1992). In 1997 Petaev et al. delivered the first report on eskolaite in meteorites. The mineral, which was previously described in terrestrial occurrences, was discovered in a Gibeon section. Petaev et al. also discovered brassy metal-troilite-daubrelite masses and sulfide bearing vugs in Gibeon cut sections (Petaev et al. 1997). A feature which had previously been discovered in the Albion IVA fine octahedrite. In Gibeon the sulfides occur in the shape of loosely packed inequigranular, irregular metal and sulfide grains and aggregates. Petaev suggested their formation due to accumulation of detrital mineral fragments and intergrowths without subsequent cementation, rather than crystallization from a melt or condensation from a fluid phase. Petaev concluded that the formation of these rare objects was a planetary-wide process on the IVA parent Body. On occasion of their research on remnant magnetization, Fukuhara et al. (1998) detected terrestrial magnetic contamination on a Gibeon sample and the authors noted that any analysis of iron meteorites based on their magnetic properties may be compromised considerably by terrestrial influences. Khazanovich-Wulff added an interesting viewpoint to the current Gibeon research in suggesting that Kimberlite fields in the Gibeon area and around the Brukarros structure are related to the Gibeon meteorite strewn field (Khazanovich-Wulff 2001). The ages of the Kimberlite pipes and the Brukarros structure, to which Khazanovich-Wulff denied a volcanic origin, are given with 75 Ma and Khazanovich-Wulff speculated that a regular arid climate may have existed on the Nama plateau during 75 Ma, which may have preserved the large meteorite debris among dry eolic sands. To enable the readers to draw their own conclusions we quote the Khazanovich-Wulff hypothesis: A large iron-meteoroid Gibeon having entered the earth’s atmosphere induced a powerful electrical charge on the earth’s surface which interacted with electrical fields in the earth’s interiors. This resulted in electrical discharges between this levels to form diatremes. Unfortunately the paper lacks substantial evidence in favour for such creative model. Recently Wasson (2008) delivered an extensive survey on the genesis of iron magmas and described Gibeon as consistent with the genesis of IVA irons by impact-driven partial melting of an L-LL chondritic precursor, leading to loss of volatile Ge and Ga and the reduction of FeO to lower the Ni content of the metal phase. Herr et al. (1961) determined the solidification age of Gibeon by the Os/Ir method to be about 4.0 x 109 years. While there is little doubt on the solidification age, the cosmic exposure history is extremely difficult to determine due to deep shielding of samples from cosmic irradiation. Bajo et al. (2008) and also Honda et al (2008) stated that samples of the Gibeon meteorite show an extraordinary low concentration of cosmogenic noble gases and radio-nuclides. For example, the activity levels of 10Be in Gibeon were as low as 5E-5 dpm/kg, which indicates a shielding of the sample in a depth of up to 2 meters. In the course of their work two different sets of exposure ages were determined by Honda et al. for the Gibeon samples analyzed, of which group one was determined at 3E8, and the average exposure age found in group 2 of Gibeon was given with those of H-chondrites, 8 my. 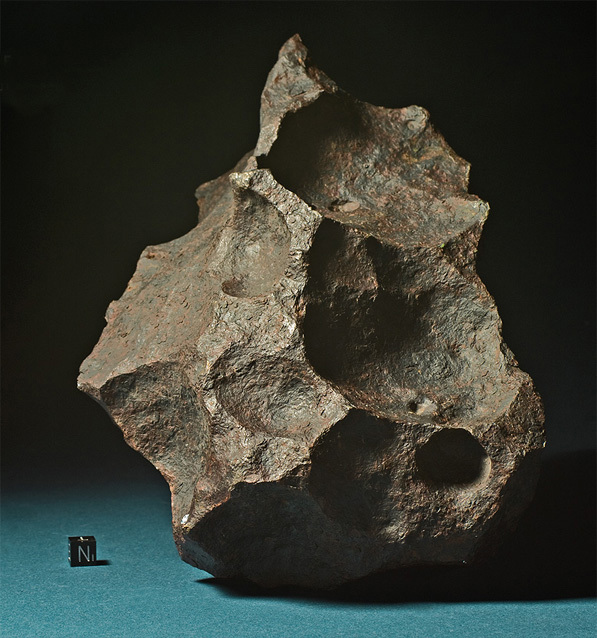 On the terrestrial age of the Gibeon meteorites even less is known. The Gibeon irons were known to the Namaquas and they used the native iron several generations for tool fabrication (Shepard 1853, Buchwald 1975). But there is no oral tradition on the fall event among the people of the Namaquas, thus it is probable that the fall occurred in prehistoric times. 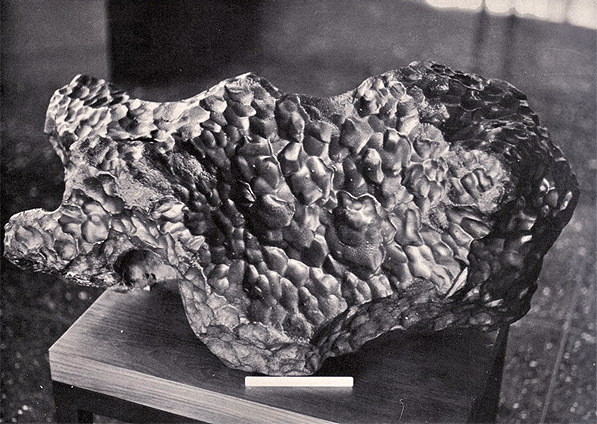 Gibeon meteorites are found on top of the Karoo and post Karoo layers and embedded in the overlying Kalahari limestone deposits, in several cases specimens were found on top of the Kalahari limestone (Range 1913). 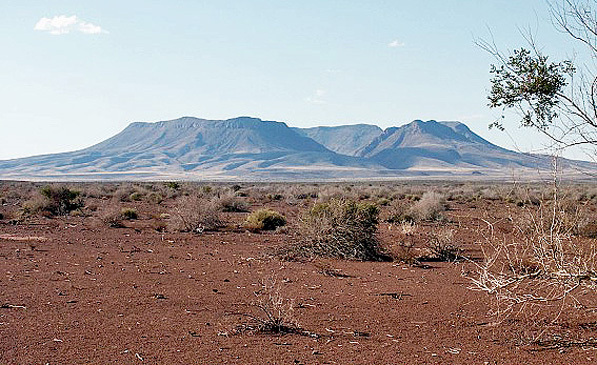 The Karoo Sequence stretches from the carboniferous to jurassic and cretaceous isotopic ages. It consists of the older, carboniferous Dwyka Formation and thereafter the Ecca Subgroup with four formations. The Post Karoo complexes have an approximate age of 100 Ma. The overlying Kalahari Sequences are composed of calcrete terraces and Kalahari sands and show an age of 39 to 2 Ma. (Grünert 2003). However in several areas Pleistocene and Holocene lacustrine lime stone sediments occur with ages as young as 13.000 to 30.000 years. (Coetzee 1987). When Range stated that the Gibeon could not have occured earlier than in the Pleistocene he referred to these lacustrine sediments on top of which he had discovered a number specimens in situ (Range 1913). 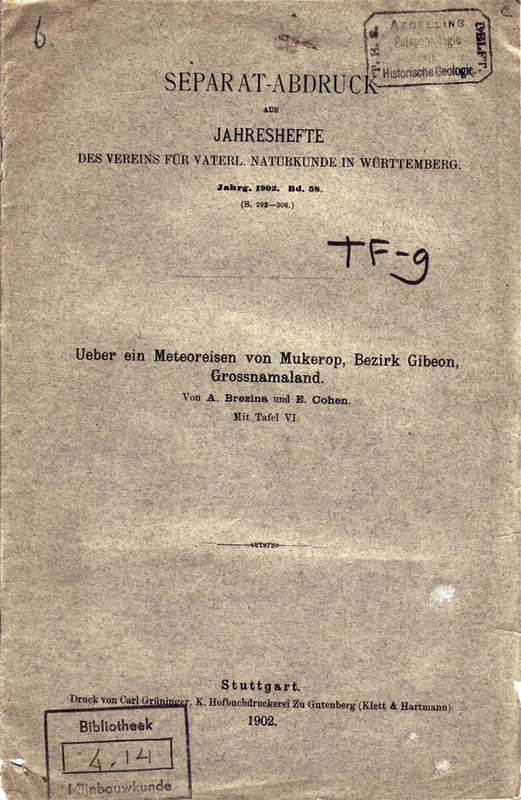 When Range stated that Gibeon must have fell in the Holocene he referred to recent calcrete sediments on top of which he had discovered a number specimens in situ (Range 1913). A meteoritic mass of 250 kg and heavier will penetrate at least several feet into the top soil, even if little cosmic velocity remains on impact. This in mind it is still possible that the Gibeon meteorite fall occurred long after the formation of the youngest Kalahari deposits and that those find locations of meteorites found embedded in the Karoo soils represent specimens that penetrated the top horizon at the time of the fall. As described above, the cosmic exposure history of the Gibeon is difficult to determine due to deep shielding of samples within the preatmospheric body and due to anomalies of the cosmogenic products. Determining the terrestrial history of iron meteorites with a suspected residence time of several ka derived from cosmogenic radio nuclides alone is a difficult and uncertain task that probably remains to be undertaken until sufficient technology becomes available. Several researchers emphasized the pristine surface texture of many recovered Gibeon specimens. Buchwald speaks of a not too high terrestrial age, and states that the meteorites are well preserved and lack any deep attacks. The heat affected α2 zones observed by Buchwald were 0.5 – 2 mm thick, indicating that little surface material was lost to corrosion. If one compares Gibeon with other irons found under similar conditions, and of which approximate fall ages are known, Range’s geological dating of the Gibeon fall makes a lot of sense. Based on the few facts available it appears that the Gibeon meteorite shower occurred between 5,000 and 30,000 BP. The total known weight of the recovered meteorites today exceeds 26 tons and the preatmospheric size of the Gibeon body was determined larger than 3 meters (Bajo et al. 2008). More than 74 larger masses (>100 kg) are known today and the number of smaller masses (< 30 kg) collected very probably exceeds 1000. The Gibeon meteorite shower is the 6th largest in total mass known at present. The dimensions of the distribution field are approx. 230 x 115 miles which makes it the largest known meteorite strewn field. In contradiction to other known strewn fields the Gibeon distribution field lacks the typical mass distribution. Apparently, large and smaller masses are spread randomly in the strewn field, with most of the smallest masses concentrated in the central area southeast of Gibeon, where most of the specimens have been found. Obviously the flight parameters of the meteorites were influenced by the kinetics of a significant terminal mid air explosion rather than by the usual aerodynamic forces alone. This way the Gibeon meteorite created rather a distribution fan than an ellipse. Meteorite prospectors have searched the area since the late 19th century and finds continued until the 1990ies (Ashwal 2001). At Buchwald’s time, the locals made little use of metal detectors to prospect for Gibeon meteorites. This changed in the late 1970ies and 1980ies. With the use of professional Equipment, also the mass distribution of the specimens recovered changed. Instead of few large masses many small specimens in the pound and kilo range were found. Unfortunately particularly these smaller finds distributed to museums and collectors lack precise find coordinates. 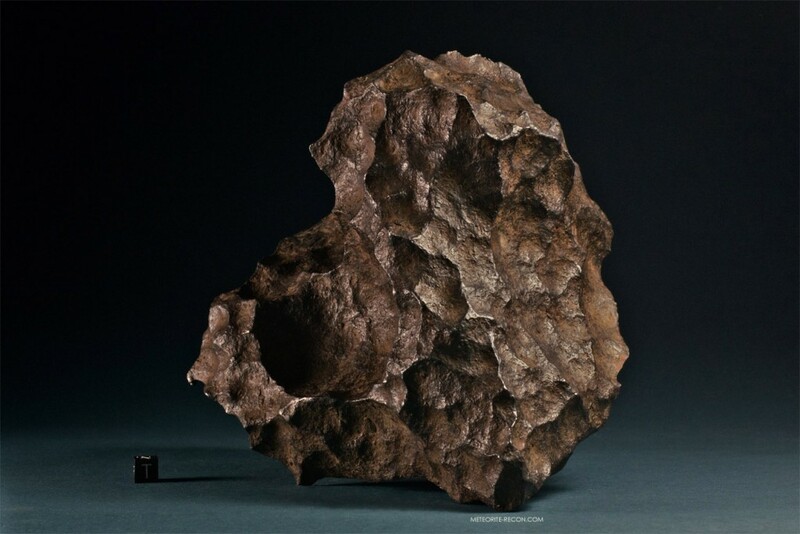 Gibeon meteorites today are widely distributed among museum and private collections. The material is valued not only for its beautiful etch pattern but also for its superior resistance to oxidation. In 2004 Namibia passed a new National Heritage act and therewith placed an export ban on meteorites. Under these laws it is considered an offence to even uncover or move a Gibeon meteorite from its find location. Gibeon specimens traded today among meteorite collectors and museums were usually exported from South Africa previous to the independency of Namibia and the current prohibition. Prices for Gibeon material have risen constantly since the export ban was established; from 50 $/kg and below for larger specimens in the 1970ies to 800 $/kg and above at present. Alexander, J.E. 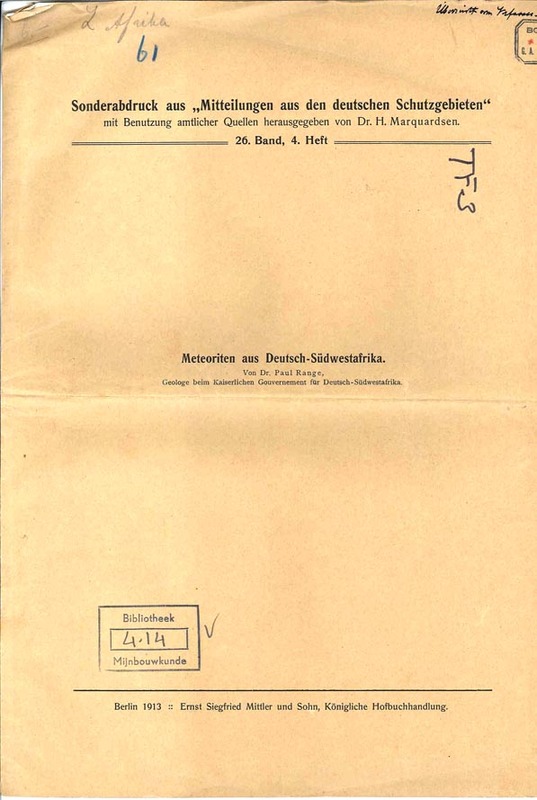 : Report of an Expedition of Discovery, Through the Countries of the Great Namaquas, Boschmans and the Hill Damaras, in South Africa. In: Journ. Roy. Geogr. Soc., 1838, vol. 8, p. 8 ff. 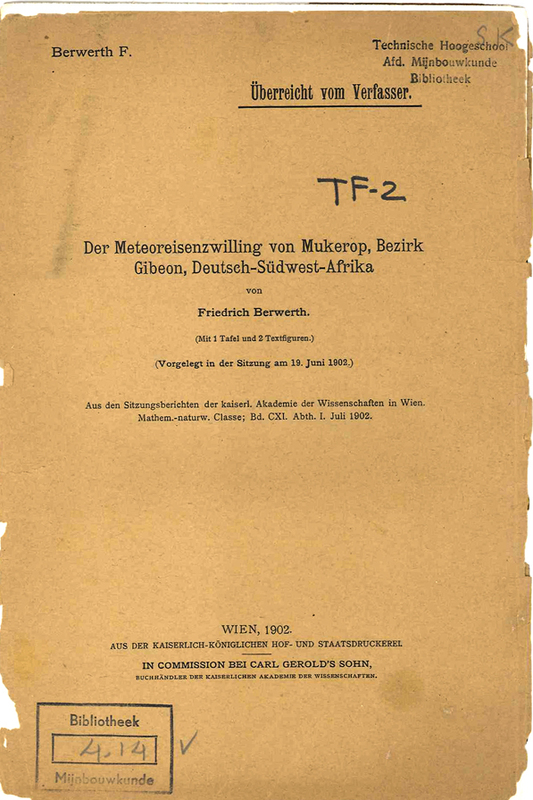 Berwerth, F.: Der Meteoreisenzwilling von Mukerop, Bezirk Gibeon, Deutsch-Südwest-Afrika. Extr. from: Sitzungsber. der kaiserl. Akademie der Wiss., vol. CXI, 1902, p.1ff. Britt, D.T et al. : Bidirectional reflectance properties of iron-nickel meteorites. In: Lunar and Planetary Science Conference, 18th, Houston, TX, Mar. 16-20, 1987, Proceedings (A89-10851 01-91). Cambridge and New York/Houston, TX, Cambridge University Press/Lunar and Planetary Institute, 1988, p. 503-512. Dierks, K. Dr. Ing. : Namibia-Bibliothek. www.klausdierks.com, 1999 – 2004. Dietz, Robert S.: Roter Kamm, Southwest Africa: Probable Meteorite Crater. 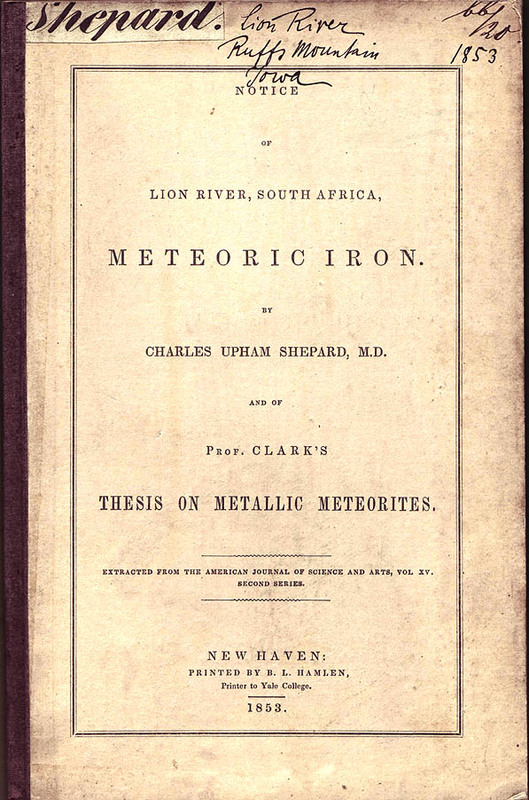 In: Meteoritics, Vol. 2, No. 4, June 1965, p. 311ff. Goverment of the Republic of Namibia: National Heritage Act 2004. In: Goverment Gazette, No. 27 (2004), p.1ff. Petaev, M.I. et al. : Mineralogy and origin of brassy, sulfide-rich masses in the Gibeon IVA iron. In: 28th Annual Lunar and Planetary Science Conference, 1997, p. 093. Range, P.: Meteoriten aus Deutsch-Südwestafrika. In: Mitteilungen aus den Deutschen Schutzgebieten, Vol. 26, Dr. H. Marquardsen (Ed. ), 1913, p. 341ff. Shepard, C.U. 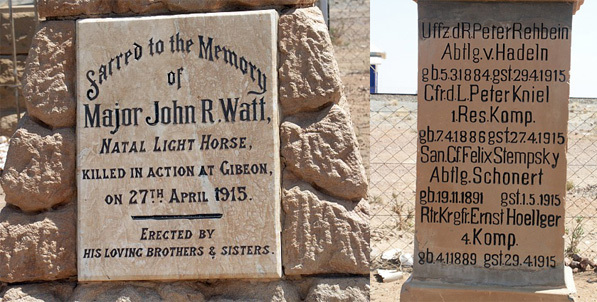 : Notice of Lion River, South Africa, Meteoritic Iron. Extr. from: The American Journ. Of Science and Arts, vol. XV, 2nd series, 1853, p. 1f.